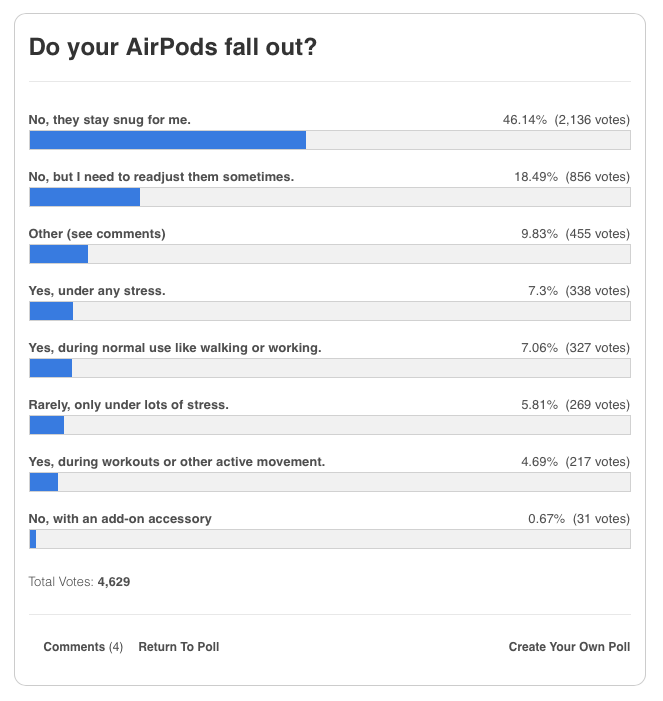 The results from our poll asking readers if AirPods fall out revealed that 65% of respondents say they indeed stay put while wearing. This majority is made up of three groups: They don’t fall out they stay snug, They don’t fall out but I need to readjust them sometimes, and They don’t fall out with an add-on accessory. Even with over half of users’ AirPods staying in place according to our survey, this still leaves a sizable remainder of potentially frustrating experiences for more than three in ten people. It’s difficult to know how accurate these results are since we don’t know how many AirPods have shipped compared to our poll sample size. It is interesting though that these results match up closely with the experiences of our 9to5Mac team. The top three responses making up the 35% of votes saying they don’t stay in included: Other, They fall out under any stress, and They fall out during normal use like walking or working. However, one alternative is the free Light Blue Explorer app. It can provide you with signal strength and potentially help in a pinch. AirPods offers a cord-free wireless audio experience with up to 5 hours of battery life. They are rechargeable through the included case that get you up to 24 hours on a single charge. AirPods 2 (released in 2019) support wireless (Qi) charging, Hey Siri, and include the H1 chip.